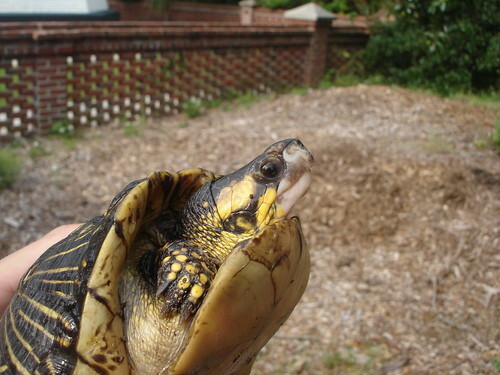 Description; Small land turtle, maximum length, 7.5 inches.High domed upper shell (carapace). Lower shell (plastron) is hinged about half way down to allow tight closure to protect head and legs. 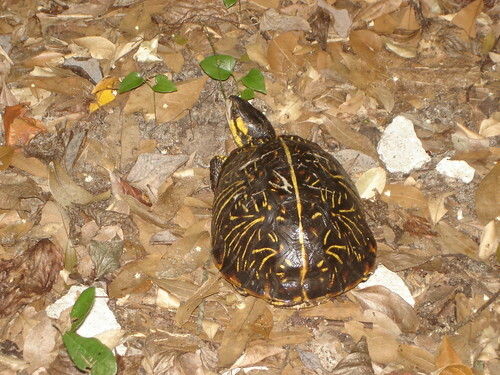 Upper shell has a black or brownish background with radiating yellow lines. These lines fade as the turtle ages. Can live to over 100 years. Notice the yellow on the side of the head and on the foot in the pictures above and below. Males have slight indentations on plastrons to help balance when mating with a female. Females have flat plastrons. The St. Augustine Lighthouse now has a population of 4 or 5 resident Florida Box Turtles on 6 acres of land. Habitat: Mesic or moist woods, fields, gardens. If undisturbed, usually lives whole life in a football-field sized territory. Chuck Meide of the LAMP program found this Florida Box Turtle (male) trying to cross a busy road and released it on the grounds of the St. Augustine Lighthouse where thereâ€™s appropriate habitat. Behaviors: Omniverous: eats vegetation, berries, snails, slugs, fungi, roots, flowers, small snakes, worms. Does not dig burrows like the Gopher Tortoise, but creates small depression in leaf litter under low plants called a â€œform.â€ Here they spend nights and retreat during the day to rest. Prefers to keep body heat between 84 and 100 degrees farenheit and during periods of high temperatures, retreats to cool shady areas, sometimes coming out only in mornings and after rains. Breeding: Mating begins in spring; female may mate several times though summer. Nesting, May through July. Females dig nests in sandy or loamy soil, usually lay four or five eggs, cover cavity; several clutches a year. Incubation takes around three months, but varies with soil conditions.